Southern Passenger Station, Morristown, Tenn. 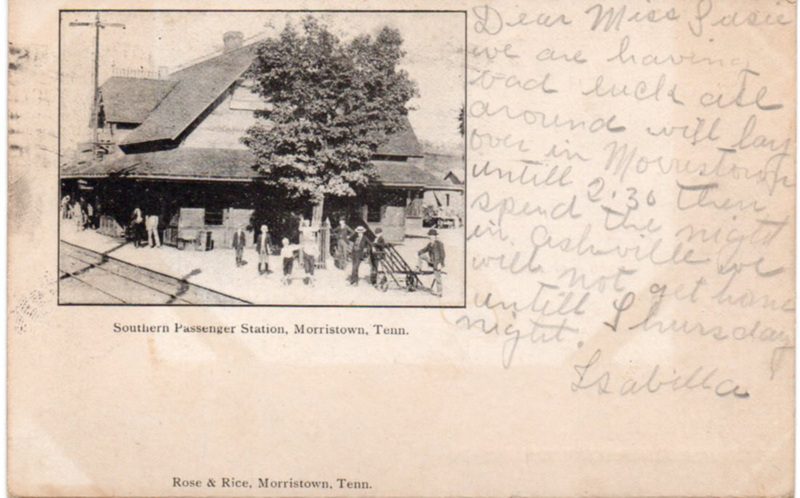 The Southern passenger station in Morristown TN pre-1906 (when his card was mailed). 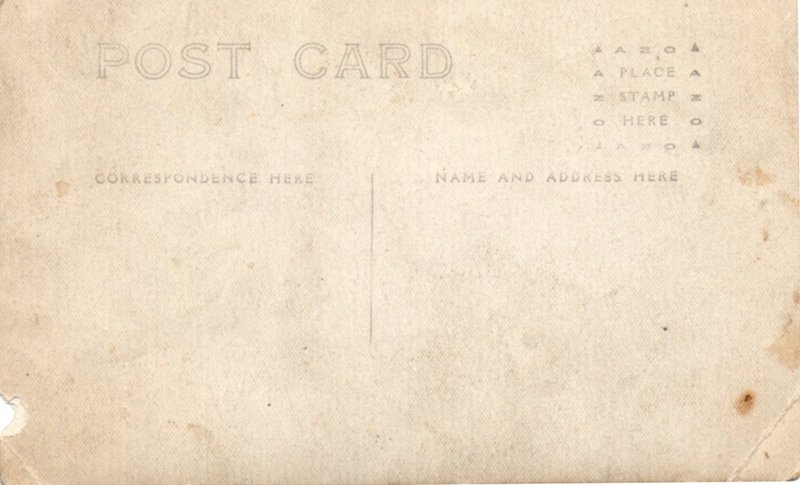 For the time, the printer was generous with the area on which to write a message, since, as an undivided back card, you could only write the address on the back. 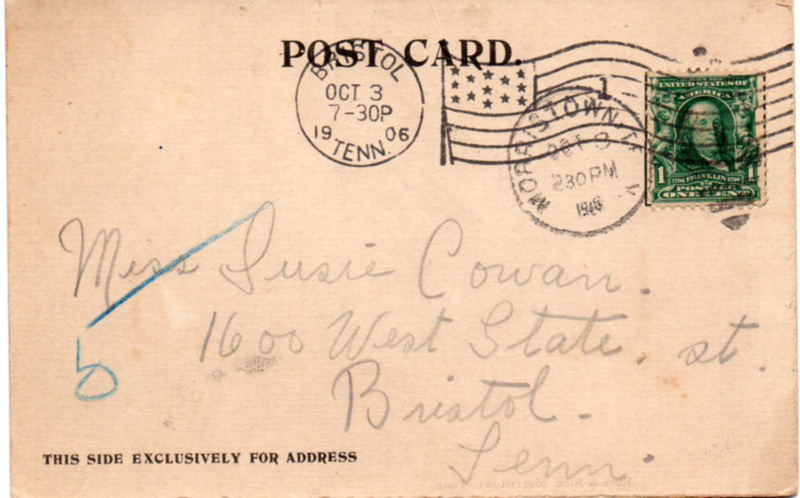 I still find it amazing that this card was mailed at 2:30 pm on October 3, 1906, and arrived in Bristol at 7:30 that evening. Isabella writes that they are laid over in M’town until 2:30, but will be spending the night in Asheville. I wonder if the train that took this card to Bristol also took Isabella and her companions on to Asheville. Kidding my older brother, I mentioned that I thought one of the people posed there at the station looked a bit like him. He was not amused. The card was published by Rose & Rice and is on a slightly heavier stock that one usually sees in postcards. Incidentally, there’s a Jennie Rose Rice (1867-1946) buried in Jarnagin Cemetery in Morristown. 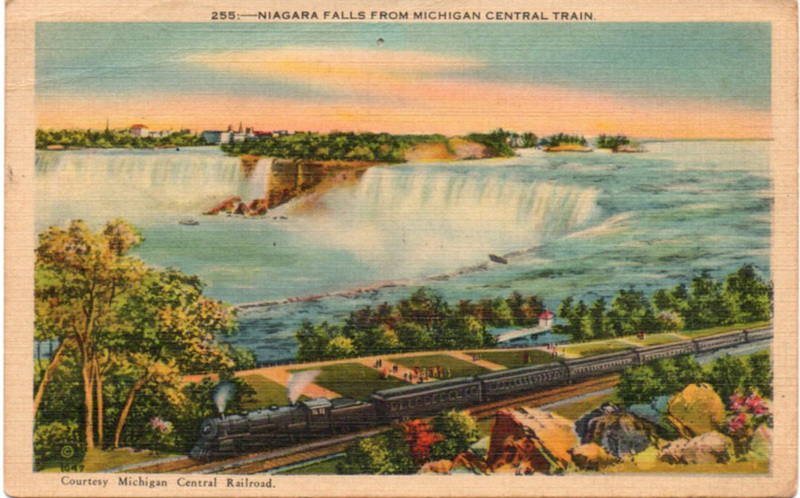 I picked up this card mainly because I didn’t know anything about Michigan Central Railroad, but soon realized that this is an interesting card. The picture was shot from the Ontario side of Horseshoe Falls. The picture shows Falls View. Michigan Central Railroad trains had been stopping here since 1885 to let passengers take in the scenery. I read that this place, in the mid to late 1700s, was known on maps as “Grand View”. 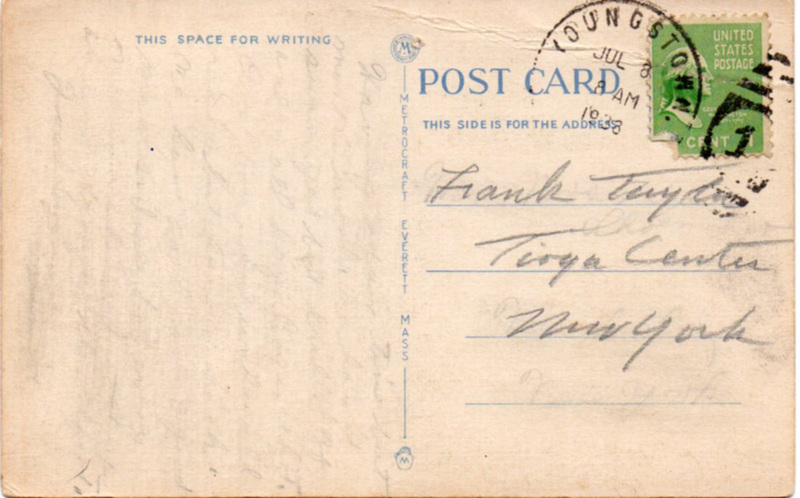 The card was mailed from Youngstown NY (north of the Falls) to Tioga Center, now just Tioga, NY, in July, 1938. Tioga is in the south of the state, between Elmira and Binghamton. The message was pretty thoroughly erased, but it seems to be the usual “having a wonderful time” thing. This flyer is 8.5 x 14. I bought this at a local flea market. The dealer had maybe 10 of them. He said they had come from an ephemera auction lot and was asking $20, firm, for one of them. I walked away first, but, intrigued, I came back and bought this one out of curiosity. Is it real? The paper appears to be brown tinted, not aged. On the back, down at the bottom, in pencil, is “3.00”, which probably means some other dealer thought it was only worth that. Under a 10-power loupe, the print looks more like melted toner that it does ink, though I didn’t see any toner splatter (note to all: I’m not an expert at this). One other point: the morning I bought this was damp and foggy. The young man helping the dealer was holding one of these when some water dripped onto it. He didn’t seem to care. If I had been holding ephemera worth $20, I would have cared, for sure. 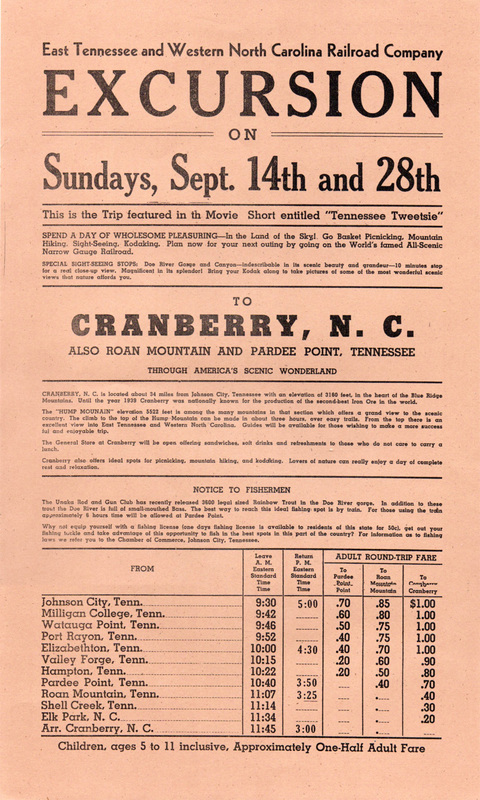 Since it references the movie short “Tennessee Tweetsie” that came out in 1939, the first year after that with Sundays on the 14th and 28th is 1941. That would be when the original, if this is a fake, was printed. Anybody know anything about these flyers? This is a RPPC, a Real Photo Post Card, a one-off. The configuration around the “Place Stamp Here” on the back with all four corner triangles pointed up puts its manufacture between 1904 and 1918. I’m no expert on locomotives, but it looks like a Camelback 4-2-2 (note the bull’s horns above the lamp). 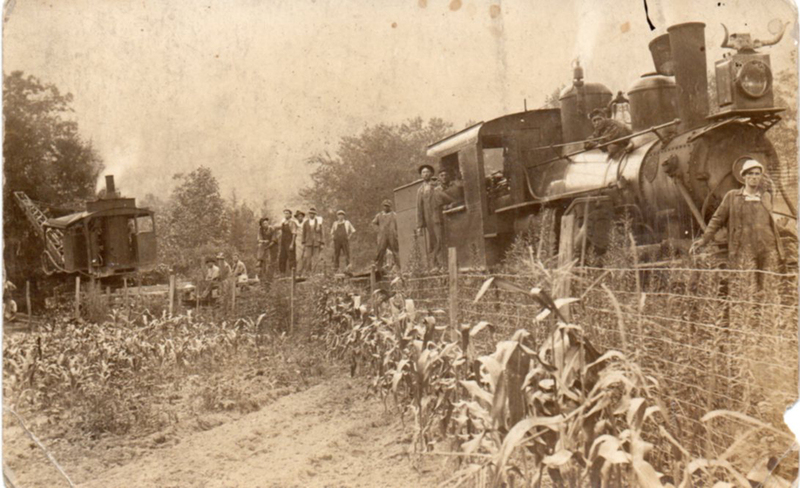 Or, if I’m looking at it wrong, it could be a 4-6-0 (Clinchfield had four 4-6-0s early on, but no 4-2-2s) If this dates to the mid- to late-teens, this gang could be laying track for the Clinchfield Railroad, which may have occasioned the picture. Or they could be cleaning up a wreck. The only reason I think it’s Clinchfield is because I bought it locally. Weak reasoning, I suppose.